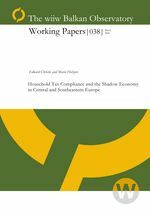 This paper presents and applies a new indicator of the size of the shadow economy based on the estimation of tax compliance in the household sector. These estimates are performed for the countries of Central, Eastern and Southeastern Europe using 2001 data. Estimates of income declaration rates and of corresponding undeclared household income are computed using household consumption data as well as detailed data on household taxation. Specific aspects such as remittances, the role of agriculture and the impact of tourism are explicitly taken into account and discussed.